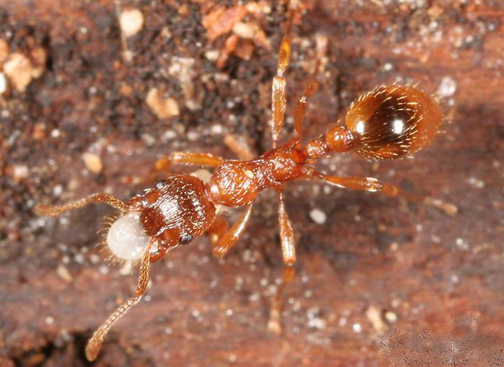 The European imported fire ant is one of many introduced insect species that are getting comfortable in the Victoria area. In Germany earlier this year, a woman called the police after her doorbell rang repeatedly in the night, terrifying her. The cops apprehended the culprit—an ant nest built tight into the doorbell was tripping the switch. My friend experienced a similar problem. Her home-security system spontaneously and repeatedly went off over a period of several months. It usually rang during the day, when she was at work. The alarm would signal the alarm company. The alarm company would notify the police. The police would come by and find nothing amiss. Telephone calls and letters from the company to my friend would follow. My friend would—again and again—call in technicians to find the problem. It turns out the problem had eight legs and a dime-sized body, and liked to hide in crannies….